The US publisher John Wiley now has a major global brand for academic and professional texts after its 2007 merger with Oxford-based Blackwell. This means that there is now UK promotion for a Wiley US textbook like this title. In the standard, squarish large format for textbooks, its 400 plus pages add up to a hefty tome. Inside there is a relatively simple structure. 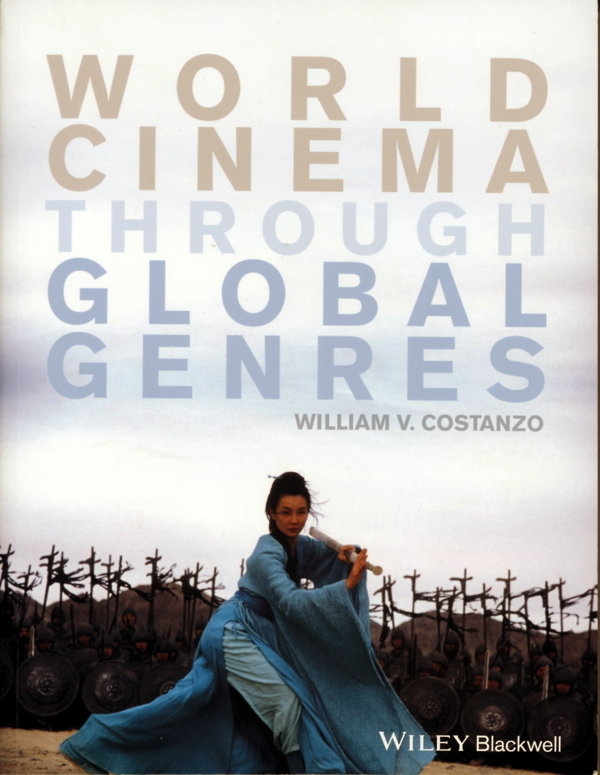 After 40 pages of introductory material on film studies, William Constanzo offers four sections, each focusing on what he terms a ‘Global Genre’. The four genres are well-chosen and comprise ‘The Warrior Film’, ‘The Wedding Film’, ‘The Horror Film’ and ‘The Road Movie’. Within each section is a general essay on the specific ‘genre cluster’ and a ‘Deep Focus’ on one specific national or regional industry, followed by four shorter ‘Close-ups’ on specific film titles. So, 120 pages are devoted to ‘The Warrior Film’ with a Deep Focus on Chinese Cinemas and Close-ups on The Magnificent Seven, Seven Samurai, Sholay and Enter the Dragon. Across the other three sections students are offered focused studies of Indian, Japanese and Latin American Cinemas. One of the quandaries for any textbook writer taking on this topic (i.e. a textbook on ‘World Cinema’) is what to include and what to leave out. Unless the book is intended as a kind of gazetteer, it isn’t possible to cover every film industry, or indeed every genre. By selecting ‘Global Genres’, Constanzo implies that he isn’t covering ‘art cinema’ or documentary or political filmmaking etc. But he still has to decide on which film industries. It seems that he has opted for those that American students are most likely to encounter as popular entertainment and perhaps feel closest to – Latin America and East Asia/South Asia. Having chosen his genres and film industries, how does Constanzo’s approach work out? On the whole pretty well I think. He devotes his space to quite detailed analysis of his chosen films and finds ways to introduce students to unfamiliar cultures. He’s fond of quoting David Bordwell and, like Bordwell (and Thompson) he uses many small screengrabs to illustrate sequences. On the positive side these grabs are presented in their correct aspect ratios – something that makes immediately apparent the difference in presentation between The Magnificent Seven in ‘Scope and Seven Samurai in Academy. Unfortunately, all the grabs are presented as sometimes quite murky greyscale images, losing much of their impact in the process. Significantly too, the single still from Sholay is not in the correct ratio since the only DVD available in 2013 would have been ‘pan and scan’. William Constanzo has been teaching a long time and he is both widely travelled and a fan of the films he analyses. There are many insights here and students should get a thorough introduction to the genres he tackles. In some ways his discussion of ‘The Wedding Film’ is the most interesting since it isn’t a genre category recognised as such by the studios. He starts from the success of My Big Fat Greek Wedding (US 2002), a small independent film that became a big global success, and notes that similar films have been successful across the globe. This is a category that draws upon different repertoires such as the romantic comedy, the social comedy and the family drama/melodrama and when he lists Monsoon Wedding (India 2001) alongside Four Weddings and a Funeral (UK 1994) and other titles from Iceland, Poland and Taiwan, the possibilities are immediately appealing. However, things get a little trickier when Constanzo chooses three films set in Israeli ‘Occupied Territories’, one directed by the Israeli (but self-proclaimed ‘international’) director Eran Riklis and the other two by Palestinian filmmakers. Again the analysis is thorough and some of the political context is explained – but not enough perhaps to fully understand the meanings in these specific films. There is also the problem that Constanzo doesn’t explore the institutional differences between the films in terms of production – how the diverse film titles that he chooses are likely to be distributed and received by critics and audiences. Again we have to accept that this isn’t the purpose of the book and there isn’t space to explore ‘film as institution’. The selection of film titles in the book is mostly very good and provides both students and teachers with useful entry points. The quartet of Halloween (US 1978), Suspiria (Italy 1977), The Devil’s Backbone (Mexico-Spain 2001) and Ringu (Japan 1998) in the Horror section has great potential. I’m a little baffled however by the inclusion of both La strada (Italy 1954) and A bout de souffle (France 1960) as ‘road movies’ in the final section. These two European art movies seem out of place. They require more space in order to explain their significance in film history and their relationship to film movements such as Italian neorealism and La nouvelle vague as well as their relationships to genres. They also hint at that academic sense of discussing the canon rather than engaging with the popular genre films that have appealed to broad audiences. What I mean, perhaps, is that they offer examples ‘known’ to US scholars and cinephiles rather than enjoyed by contemporary popular local audiences. As this is a textbook I should add that each of the four sections includes timelines showing major historical events in the ‘Deep Focus’ region plus selected film releases and an extended list of titles from around the world in the ‘genre’ section. These are useful references as are each chapter’s reading lists and the questions that accompany each case study film analysis. There is also a glossary, a full index and a companion website with a teacher’s manual and other support materials (though you need to register as an ‘instructor’). I think this could be a useful book for any teacher wanting to introduce students to films beyond Hollywood through a focus on genres. I suspect that in the UK the Wedding and Horror sections might work best. One word of warning. I found the Deep Focus sections to be variable in that the Chinese section is dominated by an analysis of Crouching Tiger, Hidden Dragon (2000), and the Indian one is flawed because it underestimates the so called ‘regional’ film industries and the recent growth of independent productions. The Japanese one is OK but rather limited, but the Latin American section is more detailed and a good introduction. This entry was posted in Book Reviews and tagged Global Genres. Bookmark the permalink.